Dr. Anne Hallward is the host and founder of Safe Space Radio and a board-certified psychiatrist in Portland, Maine. Anne’s interest in difficult subjects began in her teens, when she noticed how few adults around her seemed to be talking about intimate or difficult subjects. Formerly on the faculty at Harvard Medical School and Cambridge Hospital, she designed and taught courses on death and dying, cultural competence, sexuality, and psychiatric interviewing, and has published on death and dying, cultural bias in medicine, sexuality, and hunger in the Philippines and Bangladesh. Anne is the recipient of the Ulrich B. Jacobsohn Lifetime Achievement Award from the Maine Association of Psychiatric Physicians, the Jeanne Spurlock Social Justice Award from the Association of Women Psychiatrists, and the Exemplary Psychiatrist Award from the National Alliance on Mental Illness (NAMI). 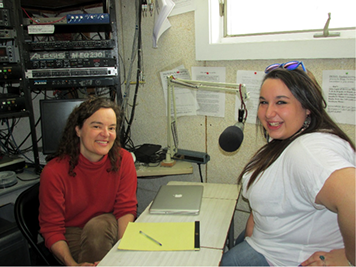 She has also been recognized for her work in radio with a Gracie Award for Best Host of a Local Radio Show. Anne speaks internationally on stigma and shame, traumatic silence, and voluntary vulnerability as a form of leadership. Could there be anything lonelier than not being able to talk about something terribly difficult—something that no one feels safe talking about? One of the greatest causes of social isolation is carrying the burden of stigma, shame or silence. We need safe spaces, or safe people, for sharing what is keeping us isolated and ashamed. Safe spaces are essential to breaking through the walls of isolation. I’d heard of Safe Space Radio in the years I’d lived in Maine yet had never listened to it until I moved to Boston a few years ago. Anne Hallward, a psychiatrist, was the host, so I’d wrongly assumed it was for issues about mental illness until I recently discovered it’s for talking about anything that’s hard to talk about. The first thing I saw on Anne’s website for Safe Space Radio says it all: The show about the subjects we'd struggle with less if we could talk about them more. Heartened after reading her engagingly informative website and listening to a podcast, I reached out to her, first with an email, and then with a phone call. She graciously answered, and we spoke right away. I was grateful that Anne could take time for an in-depth conversation about what it takes to create a safe space, and how safe spaces help us break through isolation. Our conversation alone was powerful enough to give me a boost to be more courageous in “going there” with the topics we usually shy away from. After speaking with Anne, I have a new motto: Courage is contagious. Val: Since launching Safe Space Radio in 2008, you've interviewed hundreds of guests. Though you’ve covered a wide range of compelling topics, has there been a common, prevailing message from all your guests through the years? Anne: Yes, there is a common message. People have a wish to turn their struggles into a gift for others. They give voice to hidden and silenced stories in order to help others. We started out with a focus on reducing the stigma of mental illness, so I talked with many people who had struggled with depression, anxiety, or addiction. Each guest wanted to share their story because they didn’t want others to feel as alone as they had. They wanted to help to reduce shame and stigma. Soon we began to include a much wider range of topics including homophobia, racism, sexuality and death and dying, and each guest brought the hope that the story of their struggle could be freeing to others. Val: Because we all have a sense of what a safe space means, I would love to know what safety means to you. Anne: I used to think that safety referred to the absence of physical threat. But now I think of it more internally, as the feeling of being able to be fully oneself. A common threat to a sense of safety is shame, and the forces, both internal and external, that tell us that we are not good enough. So, safety begins inside ourselves and then extends to our personal relationships, our communities, our culture, and our nation. Safety means being able to reveal our whole selves to each other and that entails two important things: feeling able to share our vulnerability as well as our strengths. The invisibility of either side is painful, so being safe means we are free to express both parts of ourselves. For example, when thinking of refugees, we often only see their suffering and don’t see their gifts. They had to flee their country, arriving here as people of color, needing help. The lens of a stereotype can blind us to their extraordinary gifts. For women, and people of color, and those with disabilities and other marginalized identities, safety is not only about honoring difference and vulnerability, it is about seeing and respecting strength. Sharing our vulnerabilities as well as our gifts also applies to the topic of asking for help. I’ve learned from my guests that we avoid asking for help because we are afraid that our needs will define us. We fear that people will only know us through our needs or vulnerabilities. Indeed, if either our gifts or our vulnerabilities are invisible, it’s very painful. If I trust that you can hold both sides of me in your mind, and we can fully know each other—then that’s what safety means. Val: I’ve never thought of safety in that way—to be able to show our vulnerabilities as well as our gifts. So, when you have a guest on your show sharing a painful ordeal in her life that was stigmatized and shamed, her strengths still shine through. But, speaking of stigma, can we ever get rid of it? Anne: Erving Goffman (a well-known sociologist) says, “Stigma is a sense of spoiled identity that you cannot wash off.” That’s why we need to share our strengths at the same time we share our vulnerabilities, so the needs don’t end up defining us in a stigmatized way. We need to see each person as whole. Safe Space Radio is one public health approach to fostering greater empathy and understanding in order to reduce stigma. As the famous gay activist, Harvey Milk, once said, “This is how the revolution will happen, one lonely teenager at a time.” Each time someone dares to come forward publicly with a silenced story, the culture shifts incrementally. Val: Your message is powerful. But what if we are socially isolated and don’t have a safe person to turn to? To confide in? Anne: Therapy has a tremendous value here. Many of us have had painful experiences of trying to share our vulnerability with someone, and feeling judged or rejected, so we might be understandably afraid to make ourselves vulnerable again and could benefit from a therapist with whom we can practice being vulnerable. Support groups are also spaces to practice being vulnerable. If there are no support groups that you feel you can belong to, then you could start your own. For example, Alyson Thompson, a biracial woman in St. Louis was struggling with feeling left out, isolated and feeling like there was nowhere she belonged. She created a monthly meet up group through Facebook, called “Mixed Feelings” which has attracted a large group of other biracial folks in her area. Val: That’s a great name for her group. Facebook was an ideal way for Alyson to launch her group. But looking at social media overall, do you think it decreases social isolation or increases it? Anne: Social media can go both ways. It can bring people together (as it did for Alyson), but it also can be isolating because comparing ourselves to others can be a source of great loneliness. Research on social media is not my area of expertise, but social media seems to perpetuate “in your face” comparing of ourselves with others which can make us feel inadequate and alone. Val: What inspired you to start Safe Space Radio? Anne: From a young age, I’ve always been hungry to talk about the things that weren’t named--topics that were avoided and kept secret. When I was in medical school doing my pediatric rotation, I watched children being held down while tubes were being put in them, and watching their distress really troubled me. Of course, these procedures were necessary and life-saving, and were done with the best intentions, but it still troubled me, and I wanted to find out more. I began doing research on this topic, as well as research with my own medical records from my childhood. I made a discovery. I found out that I was hospitalized for a serious infection as a toddler of 18 months and isolated for 10 days on an infectious disease unit. My mother had just given birth to my younger sister and was not allowed to visit me for those 10 days. This was a traumatic experience for me, and I had many nightmares throughout my childhood. Yet no one ever spoke about this. Childhood medical traumas like these are often unrecognized, because the intention of the doctor is to help the child. But from the perspective of the child, the experience may feel akin to assault. But thank goodness for my medical records, and for medical school that uncovered what had happened to me! I felt a great sense of relief that my early experiences could be named. And I felt a deep passion to humanize our patient experiences by sharing our stories. I now ask new patients about medical trauma whenever I take a trauma history, and this has brought up so many stories of suffering that the person hadn’t fully understood or recognized as being legitimate trauma. I began a research project by interviewing women with a history of childhood medical procedures, measuring the long-term psychological consequences. The surprise to me was how grateful they each were to have their struggles validated, and how eager they were to let me use their stories to try to change and humanize medical practice. 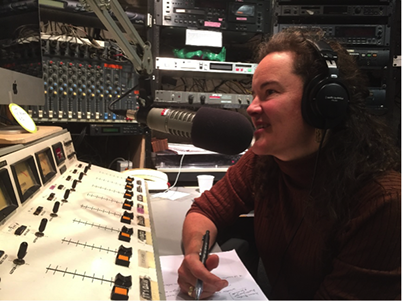 The experience of living with the shame of a silenced story, then discovering the power of telling it for my own healing and the healing of others inspired me to begin Safe Space Radio. Val: That is an amazing story, Anne. It must have been so frightening at 18 months old to be isolated in a hospital room, separated from your mother among strange people in white coats doing painful procedures. It’s so important to tell this story. Anne: I would like to share something I learned from guests on my show about what it takes to tell our stories. I used to think my role as the host was to create a really safe space so my guests could tell their most courageous story. But over the years, I’ve learned that I had it backwards; it was their courage that creates that safety for others and for our listeners. Where there is safety, there is someone who has had the generosity to make it so through their own courage. When I was interviewing Ebrahim Rasool of the Truth and Reconciliation Commission of South Africa, he told me a story about the role that psychiatrists can play in fostering courage. He said people who had been tortured were offered an opportunity to see a psychiatrist before they gave their testimony to the commission. The role of the psychiatrist was to foster their courage, to help them tell their story and give voice to their silenced trauma. He called this the work of “en-couragement.” He told me that we should always think of the word en-courage as having a hyphen. He taught me that hearing the stories of others and being taken seriously when we dare to speak foster our courage. Courage is contagious. Learning about the meaning of en-couragement transformed my work as a clinician. An important part of my role as a psychiatrist is to foster courage. Val: It rings so true when you say courage is contagious. We can foster courage in each other by telling our stories. That’s why Safe Space Radio is so powerful. I’m wondering what topics you will be covering this fall? Any new initiatives? Anne: We are now in conversations with WBUR to be our distribution partner to NPR stations nationwide. We are creating a 4-part series that covers topics that are hard to talk about. The first show is called Apologies. What do we need to make our apologies truly healing? The second show is Asking for Help. We often underestimate people’s willingness to help and miss opportunities to be supported by others. Our third show is called Loneliness. How can we reduce the stigma and shame about loneliness? And finally, the fourth topic is Talking to Kids about Race and Racism. White people tend to feel awkward about this topic. How can we find useful ways to help kids understand and begin to address the disparities they see around them without reinforcing stereotypes? Val: We could learn so much from courageous conversations about these topics. Anne, you’ve opened my eyes about what a safe space really means and about how our stories foster courage in ourselves and one another. People like you encourage us to be brave and to speak about the unspeakable things. Anne: Thank you. I enjoyed our time.